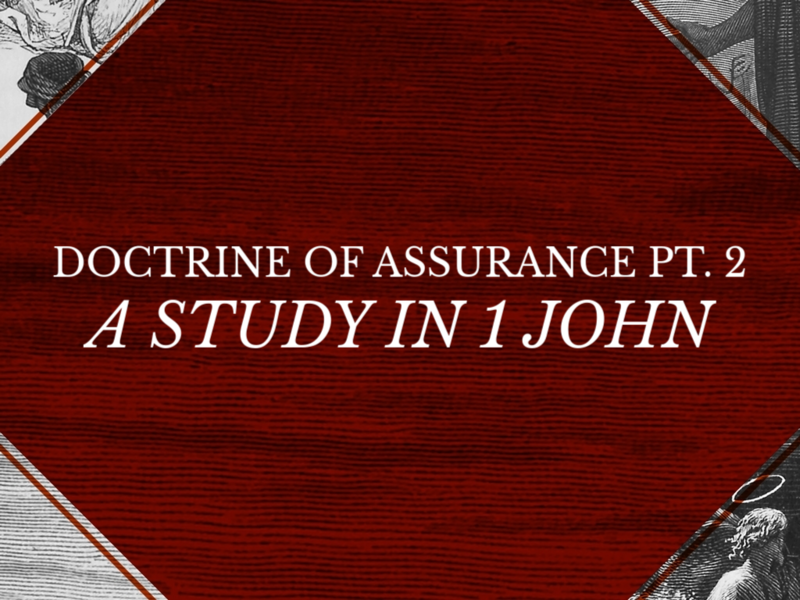 Last time we began looking at the doctrine of the assurance of salvation as it is addressed by John in this little letter of 1st John. For those who are asking: “How can I KNOW, that I am saved? How can I be sure I am one of Christ’s and belong to Him?” John will lay out his answers. If you are not yet a Christian – John will speak to you. He wants you to know your true spiritual state so that you can come into fellowship with God and Christ and the rest of the saints in Christ – though the Gospel. If you profess to be a Christian – John will help you evaluate whether or not that claim is true – he’ll guide you into using Biblical means to arrive at a solid answer. And if you are as this text says – one who already does “believe in the name of the Son of God”, but for some reason(s) are plagued by an inability to gain a solid and lasting assurance of your salvation – John will give you a series of proofs that taken cumulatively, are intended to settle your troubled heart and mind. OBJECTIVE PROOFS: What does God say? SUBJECTIVE PROOFS: What can be Observed? OBJECTIVE proofs to keep us from depending upon feelings and speculation. And SUBJECTIVE proofs to keep us from denying what the Bible says are the things which accompany genuine spiritual life. We looked at the first of these last time, but so that you have a grasp on where we are headed in this study – here is the road map of how John addresses this issue all the way through – even as he addresses a number of other topics. 1 – What is my relationship to the Word of God? 2 – What is my relationship to God in Christ? 3 – What is my relationship to Sin? 4 – What is my relationship to the People of God? 5 – What is my relationship to the World and its Values? 6 – What is my relationship to the Spirit of God? 7 – What is my relationship to the Resurrection? 8 – What is my relationship to Prayer? Before we dive directly into the text this morning, let me lay down a couple of things I hope will be clarifying for you as you consider this letter by itself and our topic in particular. A. John’s unique style in this letter. Theologians agree it is unique in the New Testament and somewhat defies clear structure. #1 What is my relationship to the Word of God? John opens the letter talking about the testimony of the Apostles in their having seen, heard, and touched the Word of Life – Jesus. This witness is what you and I have in the 4 Gospels and the rest of the New Testament. And John goes on to say this is in accord with the rest of Scripture. Hence the point that if anyone wants true assurance of their salvation, they need to stand in a right relationship to the authority of the Word of God. But you’ll remember John didn’t make that case in one spot and then move on. Instead, he started with this thought in his opening, and then came back to it, amplifying and embellishing it as he went. He puts the idea out there, then spirals back to it over and over while inserting other topics in between. John will do this with each of the 8 relationships and other topics he writes about here. So it can be a little tricky to pick up on. You will remember that in every instance we cited last week, John never does anything like set quotas. The question isn’t whether or not I read a chapter or a Psalm or chapter of Proverbs each day, a book a week, etc. That kind of thinking, no matter how well intentioned leads you right back into a performance based treadmill. You’ll do a lot but not get anywhere. Each of us has to wrestle both with the remaining sin within us – which resists putting spiritual priorities first, AND, the temptation to turn those priorities into self-made laws that if we violate – constitute sins the Bible never talks about. Years ago I worked for a man named Dale who had come to Christ but was in a very legalistic denomination. And when I say legalistic I mean it. Men could not wear wristwatches or even wedding rings because it was jewelry and thus worldly. Women couldn’t shave their legs because this too was worldly. As it turns out, he really was quite a gifted guitar player. Apparently there were no Church rules about owning a really expensive and flashy guitar. That said he shared with me one day his experience and something he used to gauge his own spiritual health at times. He told me that as long as he only played hymns and worship songs on his guitar, he could play like Tommy Johnson in “O, Brother, where art thou?”. Now my guess is, that sudden cramping and inability issue was in fact a psychosomatic response to an ill-informed conscience. But nonetheless, when it happened, he judged he was in a poor spiritual state, and when it didn’t, he assumed he was OK. This is what John’s teaching here will help us avoid. John is asking us to examine what our attitude is toward the Word of God and what place it holds in our hearts and minds, not whether or not we read secular material as well – or how MUCH of the Bible we read how OFTEN. The question is, is The Word is not something we cherish and seek to understand? If it is not authoritative for us. If there is no sense of its importance, truthfulness and claim on us, then we are in one of two unenviable places. Either we are not Christ’s after all, or, we are in very poor spiritual health. Just as a physical illness can result in a loss of appetite, genuine Believers may experience a loss of appetite for spiritual things – especially the Word – at times. If there has been a long neglect of spiritual things; unrepentant sin, carelessness in spiritual matters, unforgiveness, bitterness, or especially a controversy with God over something in the Word you do not like or a place where you do not want to yield to its authority – you may well be soul-sick. I might add here too how it is that chronic illness and pain, emotional or physical can have a severely dampening effect on spiritual vitality. Whether it’s a pebble in the shoe or a tiny speck of dust in the eye, pain draws all attention to itself. It utterly distracts. Which action draws our hearts and minds off of spiritual things. Our spiritual sensitivities become dull and for a time may even seem to vanish. But if you remember a time when the Word of God was something you sought out and could not get enough of, but now that’s no longer the case – praise God it once was! That’s a good sign. And now is the time to seek Him for a restoration of that passion and joy. Repentance as turning around, changing course, whether the cause is sin, neglect or legitimate distraction. But if this has never been the case with you that is another story altogether. You give lip-service to it being God’s Word, but in truth, you’ve never really applied yourself to study it. You’ve never really sought it out to know it except for comfort or guidance in a particular time of difficulty. It has never opened up to you and spoken to your heart in a way which makes you tremble at the exposure of your sin, or rejoiced your soul in the revealing of Jesus Christ in it. Then dear listener, you need to be born again. You are not a Christian. At least not yet. Stay with us in this study, so that you might savingly come to know the Lord of glory in all of His forgiving grace and the salvation that comes through faith in the atoning sacrifice of Jesus on the Cross. #2 What is my relationship to God? At first blush this might seem almost a toss-a-way question. After all, haven’t we all been told about the universal fatherhood of God? Don’t we hear it all the time – “we’re all God’s children”? And there is certainly a sense in which that is true. By virtue of God being our Creator, every human being has the Creature/Creator relationship to God. But the idea of relationship is a pretty broad category – and relationships occur on any number of levels. I have a relationship with the President, because we are both citizens of the same nation and he is our elected Executive and Commander and Chief. But I have no personal relationship to him. And even if I did, I could not claim to have a blood or familial relationship to him. Coming to grips with the real nature of our relationship to God is absolutely vital, both to our salvation itself, and our assurance of it. For the reasons we’ve just stated above, that relationship needs to be defined, and ultimately, it needs to be a salvific one. And for that, we need to know what it is based upon. Judas had a relationship with Jesus – a long, intimate and even co-laboring relationship. But it did not save him. In the end he betrayed Jesus, took his own life and died lost. What is being addressed in the text is something much deeper. Something John teases out in a succession of statements in the letter. Simply believing that God exists and even having some theological accuracy to your belief, may be nothing more than the belief demons have! The 1st aspect of being in a right relationship with God is that that relationship is through having believed the Gospel – the witness of the apostles and the Word. Have I believed the apostolic witness of Christ, and by IT, been brought into right relationship with God the Father, and the Son? Have I believed the Gospel? : That Jesus Christ is God’s Son, very God and very man, come into the world to die a substitutionary atonement on the cross for human sin. For the proclamation of eternal life that John mentions in these opening verses is the proclamation that eternal life is nothing less than Jesus Christ Himself, and that John and the others really saw Him, really heard Him, really touched Him, really believed Him and really trusted Him themselves. And so is that you today? Is what Paul says is true of Christians in Eph. 2:11-13 true of you? Is your relationship to God one of having been once alienated from Him by your sin, but now reconciled to Him through the blood of Jesus? Are you personally trusting in the substitutionary death of Jesus on the cross for YOUR sins? Is He YOUR sin bearer? Forgive my repetition here but this is so absolutely vital both your salvation and the assurance of it that I simply do not dare leave it in any possible doubt. Is my relationship to God based upon having believed the Gospel? And having believed, am I now in service to God, in partnership with His goals? Am I now in fellowship with Him? In partnership with Him? Have His goals become mine? Specifically: The Propagation of the Gospel of Jesus Christ, and personal conformity to the image – to the character of Christ? Everything else which will follow both in this letter and in our study hangs upon it: Have you believed the Gospel? Not just believed what the Gospel is, are you trusting Christ alone for your relationship to the Father? You see it is not enough to know the truth of the Gospel message, you must actually trust Christ. If you are not trusting Him, you my friend are not a Christian. You do not have salvation yet. And the reason why you have no assurance of salvation is that you are not yet saved! John begins by advancing the fact that we need to be in a partnering fellowship/relationship with God through Christ. Since Jesus IS the eternal life which was manifest – we receive that life in Him. But then, John goes on to amplify the nature of this relationship even more as the letter progresses. And so we come to a 2nd aspect of a right relationship with God. So to the question: What is my relationship to God? I must be able to answer – that I have been reconciled to Him through believing the Gospel and trusting in the sacrifice of Jesus on the Cross for my sins. And oh what a wonderful part of our relationship to Him this is! Those joined to God in Christ Jesus have continual cleansing from our sins. Little can be more important to a solid sense of the assurance of our salvation, than to know that even as life progresses and we fall into the very sins we struggle against over and over – there is CONTINUAL CLEANSING available to us. Salvation wasn’t hitting a cosmic reset button and now we’re left to ourselves not to mess it up again. It is not a 3-strikes and you’re out proposition. What is my relationship to God? I can detect whether or not I have believed the Gospel. That is a SUBJECTIVE thing I can check out for myself. But we will move from that subjective reality, to some marvelously wonderful OBJECTIVE things to cling to. And there is objectively much, much more more! You can’t “have” her – you can’t have the bond you want with her. It’s not right before God. But as our text says here, no one who denies that Jesus is the Son of God HAS – is joined together in a bond – with the Father. BUT! Whoever confesses the Son – DOES have such a bond with the Father. There is a true union brought about and not a mere acquaintance. Do you confess that Jesus is the incarnate Son of God? Having been reconciled through the blood of Christ, experiencing continual cleansing from sin and bound to the Father – He also guarantees our acceptance at the judgment. And the best way I can think of expressing what that looks like is to co-opt the description used of Adam and Eve in the Garden before the Fall: They were naked, and unashamed. Because our relationship to the Father is rooted in our union with Christ – Christ IS our righteousness as Philippians 3:8-9 tells us. It is Christ in this passage who is living, active and sharper than any double edged blade, able to slice down and separate things we can’t – able to detect not only our actions but our thoughts and every motive. No creature – nothing is hidden from His sight – but everything is naked and exposed to His eyes. Well how then will any of us stand before Him naked and unashamed, fully accepted in that day? By abiding in Him. By virtue of our union with Him in Christ, we will not need to shrink back even the slightest from His all-seeing gaze. Now this is a truly astounding thing to consider isn’t it? Scripture is plain, Jesus is the only begotten Son of God. He is the only one who is ontologically God’s Son or one who shares God’s nature. He IS God. But in Christ, every Believer is brought into relationship with the Father that staggers the imagination. What is bestowed upon the Believer is sonship! Now let that sink in just a bit. It is one thing to be God’s creature. Another to be reconciled to Him after being His enemies; enjoying the experience of daily cleansing from our sin; bound to Him and so accepted that we need not be ashamed even though He knows the very worst about us; – but to be adopted into the divine family so as to be an actual co-heir of Christ. Perhaps the clearest way of understanding the nature of what this includes is captured for us in Genesis 24. You will recall that as Sarah had died, and the aging Abraham was concerned to secure a wife for his son Isaac. Abraham sent his servant off to see of there might be a suitable bride among his extended relatives. Eleazer heads out to Mesopotamia with a caravan loaded with all sorts of gifts as a token of what the prospective Bride would be gaining if she agreed to marry Isaac. So he said, “I am Abraham’s servant. The Lord has greatly blessed my master, and he has become great. He has given him flocks and herds, silver and gold, male servants and female servants, camels and donkeys. And Sarah my master’s wife bore a son to my master when she was old, and to him he has given all that he has. He will glorify me, for he will take what is mine and declare it to you. All that the Father has is mine; therefore I said that he will take what is mine and declare it to you. This is what the Holy Spirit is doing through John in this letter. Beloved, I don’t have the slightest idea of how to unpack that. We just have to take Him at His word that it is far beyond anything we can begin to imagine. For these are just the tokens, just the foretaste of being in right relationship to Him in Christ. And this life is not mere existence, it is life characterized by the most amazing word: ETERNAL! Again we did not just get a mere reset or second chance – by being reconciled to God in Jesus we received an everlasting, inextinguishable life WITH HIM! The nature of the life Jesus gives us is ETERNAL life. Not TEMPORARY life – eternal life. The very name of it assures us that once possessed, it cannot be lost. That which is eternal, by its very nature is that which abides and endures and remains forever! We cannot unpack the focus of John in telling us this last point here, we’ll do that later. But that Christ has given us free access to the Heavenly Father’s ear at all times and in all places is something to be really investigated. It is an amazing reality that throughout my day and life, I can come to the Father completely unfettered and always received with joy. In closing, let me summarize what we’ve covered so far. That one key reason John wrote this letter, is so that Believers might have a solid assurance of their salvation. That such an assurance begins by having a right relationship to God’s Word in treasuring and cherishing it as God’s authoritative self-disclosure. That assurance cannot be had apart from having entered into a partnering relationship of fellowship with God through faith in the Gospel of the finished, saving work of Jesus on the Cross. So the the question which remains today is: What is my relationship to God? Subjectively – have I believed the Gospel and trusted Christ alone for bringing me into right relationship with God the Father? Have I been reconciled to Him and brought into a fellowshiping partnership with Him through believing the Gospel and trusting in the sacrifice of Jesus on the Cross for my sins? If so – then OBJECTIVELY, all this is yours. If not – why not? Why not come to Him today? Confess your sin, rebellion, unbelief and alienation, and trust Jesus’ sacrifice for your reconciliation to Him.